Speak Out! Toastmasters | Where Leaders Are Made! Job Interview? Tongue Tied? Stage Fright? We Can Help You! Founded in 2003, Speak Out! 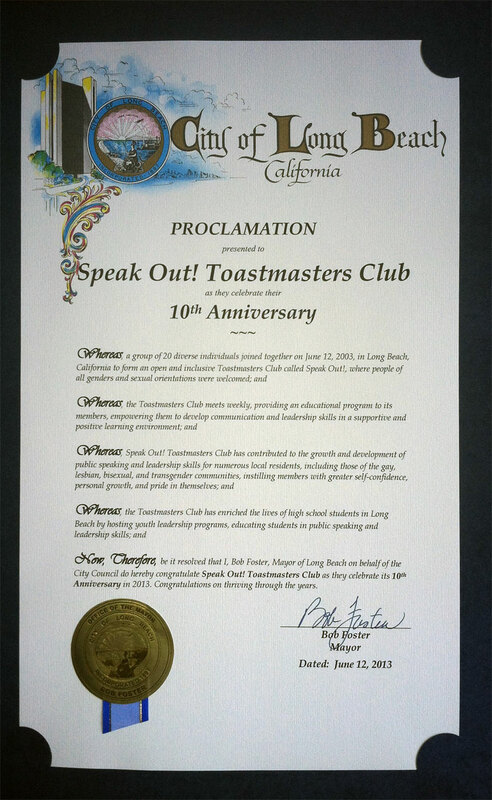 is a community Toastmasters Club in Long Beach, California, where people of all genders and sexual orientations are welcome, including those of the gay, lesbian, bisexual, transgendered, and heterosexual communities (GLBTH). Our club meets weekly for members to practice public speaking and to improve their communication and leadership skills in a safe and supportive environment, among friends. What: A GLBTH Toastmasters Club that meets weekly. When: Saturdays, 10:30 AM to Noon. Opening gavel at 10:30 AM. Please be prompt. Join us for our next meeting! You are welcome to visit our club as a guest at our next meeting. Guest participation at the meeting is optional. Dress code is casual.